DRU Fires is a long established European manufacturer of gas, wood burning and multi-fuel fires that was founded in the Netherlands in 1754. It has subsidiary companies in the UK and Belgium, and exports to many other countries worldwide. 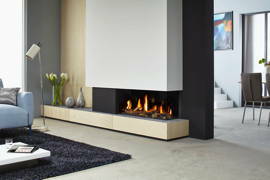 DRU has a reputation as a designer and producer of ultra-contemporary and high technology fireplace products. It has announced improvements to its popular Metro100XT series of ‘letterbox’ gas fires in time for the autumn 2014 season. The DRU Metro 100XT range is a selection of glass-fronted, contemporary gas fires that can be installed in homes, with or without a conventional chimney. The fires utilise the balanced flue system, in which air is drawn from outside the building for combustion and waste gases expelled outside using a concentric flue. This results not only in an impressive flame picture, but an energy efficiency rating in excess of 80% for all the Metro 100XT models. 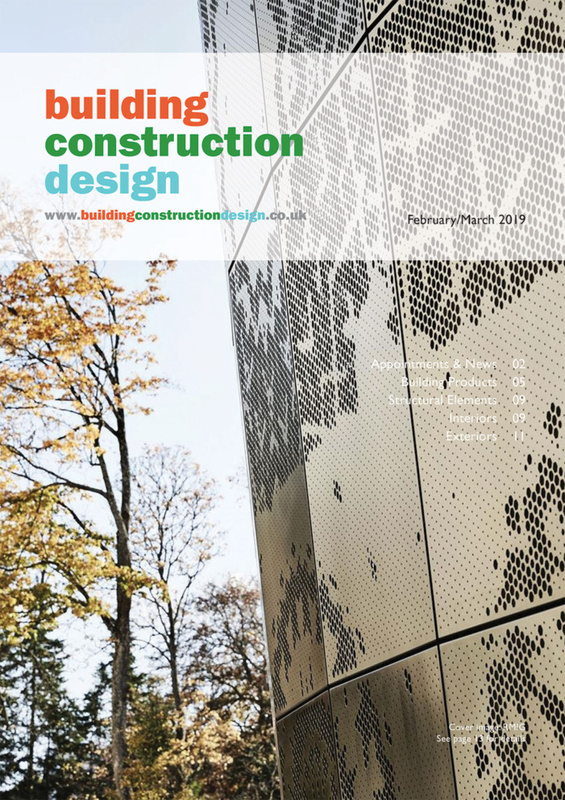 This high efficiency makes them in great demand from house builders and refurbishers, as they make a significant contribution to a home’s energy efficiency rating. 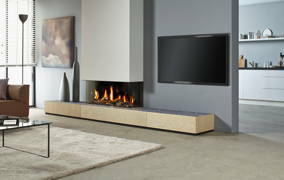 The new Metro 100XT fires have a choice of fire beds in realistic logs, stones or glass anthracite. Interiors are in black or mirrored Ceraglass for a 3D flame effect and the extra high 41 cm window can be easily removed for routine cleaning and maintenance on the standard and tunnel versions of the fire. The Metro 100XT models can be operated by a new Siemens electronic remote control or by using the exclusive DRU Eco Wave tablet or smartphone app. 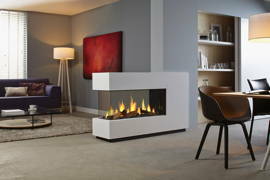 Metro 100XT2 is a 2-sided, corner version of the Metro contemporary gas fire. It can be located in the corner of a room or a room dividing wall. The addition of specially fabricated chimneybreasts and floating hearths in a variety of finishes will further embellish the beauty of this innovative fire. 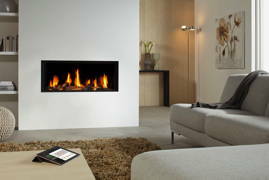 The Metro 100XTL offers a further variation in the comprehensive Metro range of contemporary gas fires. This model displays the full width on one side and half of the width on the other side. In this way you can create different focal points in adjoining rooms. 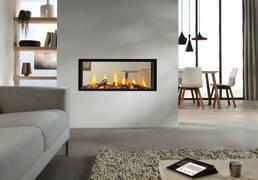 The Metro 100XTU is effectively a U-shaped fire, offering a full and uninterrupted flame picture in adjoining rooms or as a central room feature. An additional feature of the new Metro 100XT gas fires is that they can be controlled by the exclusive DRU Eco Wave app for tablets and smartphones. Most of today’s homes have a Wi-Fi network that we can use for TV viewing, online shopping, study and many other activities. In addition, we are now seeing the emergence of a whole host of clever devices for controlling everything from lighting and security to electricity and gas consumption. 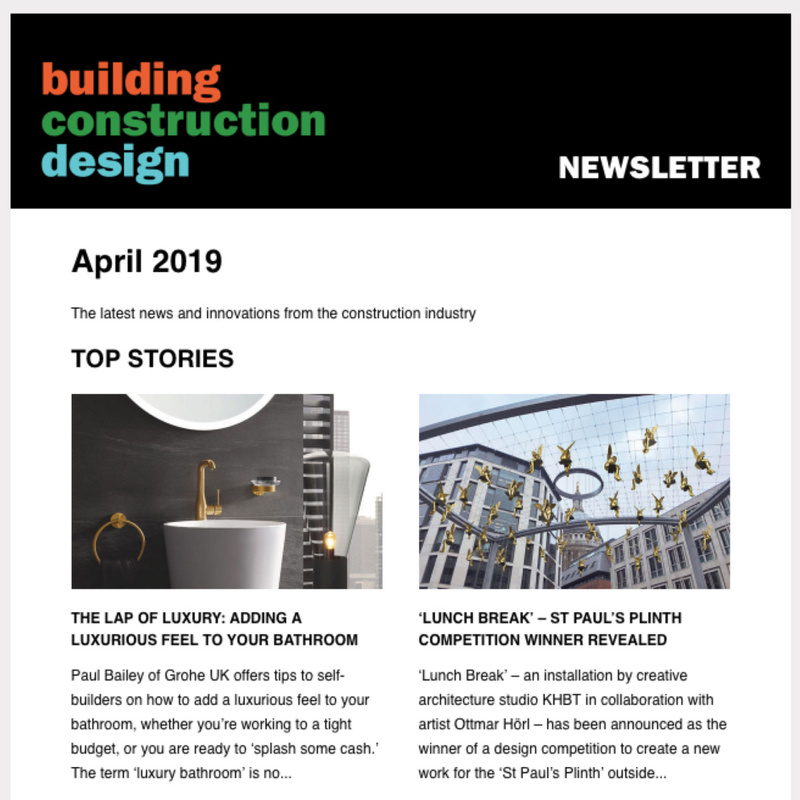 DRU has made a significant contribution to this movement with the development of Eco Wave for the Metro 100XT series and a growing list of other contemporary, balanced flue gas fires. With Eco Wave, the fire has its own IP address that is recognised by the home Wi-Fi network. In fact, the Eco Wave App can control up to five separate gas fires around the home. The heart of the system is the special Eco Wave burner. This simulates how a fire will naturally change over time, with variations in airflow and flame height, creating a realistic flame picture. Using the touch-screen graphic display, home owners can set their own preferred flame picture, whilst at the same time saving up to 50% on gas consumption. This is achieved by striking a balance between high and low flames, with the lower areas of the fire consuming less gas. The Eco Wave app comes ready-loaded with appliance registration and performance data that can be accessed by the owner and by DRU in relation to performance monitoring and fault finding. There are troubleshooting sections and the device will even alert the approved DRU dealer for servicing anniversaries and other key dates. 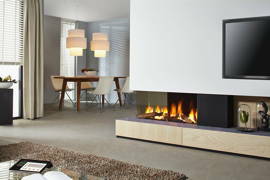 DRU designer gas fires with smart controls are available from specialist fireplace retailers throughout the UK. For further information, visit: www.drufire.co.uk.